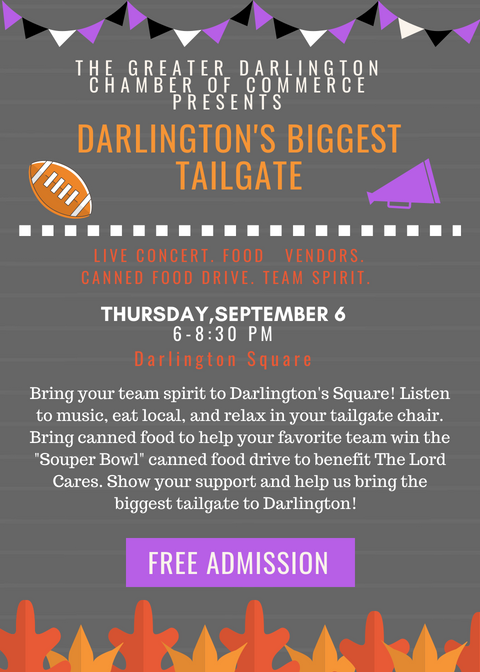 Celebrate your Falcon pride at Darlington’s Biggest Tailgate on September 6th on the Darlington Courthouse grounds. Bring your tailgate chair and canned goods to support The Lord Cares. There will be a “Souper Bowl” canned food competition to see which team can collect the most cans. At the end of the night we’ll play that team’s fight song. This event will feature Darlington High School athletes, music, and lots of team spirit. This is a FREE event so bring your friends and family!